A good simulation tool includes not only advanced mathematical algorithms and an easy-to-use user interface, but also capabilities for linking with other simulation software. Software interoperability has become more important and valuable to the end users in speeding up their design work, also enabling new types of design flows and analysis types. 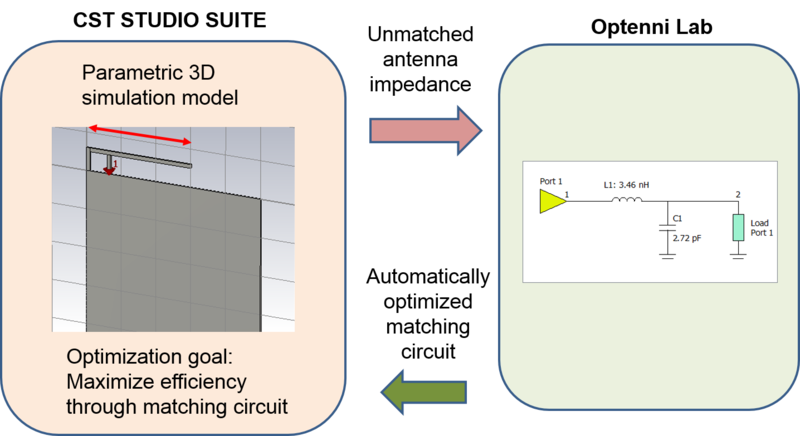 In the new version, the matching circuit is directly constructed on the CST DESIGN STUDIO® schematic, connected to an external port and simulated. The workflow works equally well with multiport antennas. We can also take the joint workflow one step further. Suppose the electromagnetic simulation model is changed – for example, by varying the antenna size and height or antenna placement. Normally, this will change not only the radiation properties of the antenna but also the impedance matching and thus the antenna needs to be re-matched after each parametric simulation. We can now combine a parameter sweep in CST STUDIO SUITE® with a post-processing step that uses Optenni Lab to automatically optimize the matching circuit for a given frequency range. Thus, the user can see the effect of changes of the physical antenna parameters to the S-parameters and efficiencies, using optimized matching circuit for each parameter combination. Additionally, we can set up an optimization task such that CST STUDIO SUITE® is controlling the parametric lengths of the electromagnetic structure and the optimization goal is the total efficiency through an optimized matching circuit. This is a coupled electromagnetic and circuit optimization problem that is very challenging to solve using a single software alone. In addition, the bandwidth potential calculation (estimation of the bandwidth of resonant or non-resonant antennas at all frequencies) and the electromagnetic isolation calculation (calculation of the worst-case isolation independently of antenna matching) can also be launched from CST MICROWAVE STUDIO® as post-processing steps. This can be used to study, for example, antenna placement for maximal bandwidth or for maximal isolation and to understand the wideband characteristics of antennas. The SIMULIA brand of Dassault Systèmes enables users to leverage physics-based simulation and high-performance computing to power sustainable innovation for products, nature, and life. Leading companies use its multiphysics and electromagnetic (EM) simulation solutions to improve the performance of their products and reduce development costs and time to market. More information at www.3ds.com/simulia and www.cst.com. © 2013 CST Computer Simulation Technology AG. All rights reserved.. Simple theme. Powered by Blogger.